Katie is a little girl who has grand adventures in art museums. When children read these stories they learned about famous works of art in an engaging way. In Katie and the Bathers Katie climbs into a painting, ends up flooding the museum and finds a painting of a magician to help get the museum back in order before the guard comes through. Kids love these books and request them over and over. Metal detecting is an interesting hobby, because it can lead in so many directions. Learning about science and history while improving research skills are all covered. The photo above shows four coins (middle row and bottom center and right), a bottle cap (bottom left), a button of some sort (top left) and several pieces of ammunition. The musket ball (upper right) is made of lead. Musket balls were used for hunting and war, but haven't been commonly used since the 1800's. While metal detecting, my son has now found three. To clean them he lets them sit in a bowl of vinegar. They are heavy and by holding them he learned a bit more about science and materials. There are many educational benefits in encouraging kids in there interests. Passion often motivates children and adults to read, research and experiment. Density is a measurement of how tightly molecules are packed together. Calculating density is easy and makes a fun hands on math and science project. A while back we measured the density of a few solid materials. This time we found the density of liquids. To calculate density first measure the quantity of a liquid (ml). Next weight the liquid (grams). Then divide to get grams/ml. Water, dish soap and corn syrup are good liquids to try. Last year for science we did an extensive cell and the human body study. In fact, I still have human body posts that will last until January. In the mean time I've been planning for this year's science study. Earth Science! I'm so excited for this topic. All summer I have been gathering resources and putting together an outline of topics. Between rocks and minerals, earth layers, erosion, climates, magnetic field, volcanoes and tectonic plates there is so much to cover. I have tons of videos bookmarked and have been browsing library books. Here's a small preview of some of the activities I plan to do. Last week bloggers shared their plans for math and the week before it was writing. There are many more subjects coming up and I'd love to see how you teach them. Here's the Schedule. What are your plans for science? We played The Game of Life for math. There's nothing new about The Game of Life. It's was created in 1860 and has been sold publicly since the 1960's. I liked it as a kid and my kids like it now. I am a huge fan of playing games to learn and practice math skills. What I like about The Game of Life is that the lowest denomination of money is $5,000. When the kids play they are constantly practicing adding, subtracting, multiplying and dividing in the thousands which helps them to understand place value. Now that summer is here we are on a school break we actually aren't doing any school. We're just playing games and following our interests which can be just as educational. To see other math games and activities please visit our Math Page. "My hedgehog need a new dress." That's a frequently heard sentiment in this house. Creating doll clothes is a wonderful first sewing project for little ones. It's wonderful because they learn a lot about sewing, how clothes are put together and the hard work that goes along with the process. What's more, when they are finished with the first project they are ready to begin more challenging doll clothes. My five year old constantly watches her eleven year old sister sew clothes for her polar bear and now has advanced another step in her own sewing. She wanted a much more complicated dress for Hedgie and was willing to do all the sewing herself. I helped her cut out the pieces and pin them together, but she did the rest. For this project she had to put in a lining, sew the shoulder seams, side seams, gather and hem the ruffle. It took several weeks and I'm amazed she stuck with it. When she finished the dress she created this white fleece dress on her own. She cut two matching pieces and sewed shoulder and side seams. Since she used fleece there was no need for hemming. She did sew on sequence and used glitter glue to line the waist and arms. For more ideas for a budding seamstress check out my craft page and my older daughter's blog. She writes all about the clothes she has created for her polar bear. There are tons of good ideas. After reading the book Archimedes Takes a Bath, by Joan Lexau we decided to do some density experiments. In the book Archimedes is challenged to determine whether or not the kings goldsmith stole some of the gold he was given to make a new crown. Throughout the story Archimedes is often so focused on his work he forgets to do normal things like eat and bathe. A young boy even has the job of ensuring Archimedes takes care of himself. During the course of the entertaining story he eventually discovers the key to determining if the gold was stolen. - Density. Density is mass divided by volume - d=m/V - It's simple to measure and calculate. We determined the density of pennies, dry beans, glass and an orange. First the objects were weighed to determine their mass in grams. Then they were submerged in water to determine their volume in milliliters (ml). The volume of liquid was measured alone, and then with the solid. The two numbers were subtracted to determine the volume of the solid alone. One milliliter is equal to one cubic centimeter. The density of water is one g/cm^3. Next the mass was divided by volume. We found that pennies were the most dense object we measured. Doing this hands-on experiment was simple, fun, and effective. Now the age old question of "What weighs more a pound of cotton or a pound of bricks?" has a little more meaning. We read Pythagoras and the Ratios: A Math Adventure and then made our own reed pipes. While working more hands-on math activities into the curriculum, Lucinda at Navigating by Joy recommended the book What's Your Angle Pythagoras. Our library didn't have the book, but it did have Pythagoras and the Ratios by the same author so we requested it. Although intended as a math adventure, the book could be used for activities relating to Ancient Greece. From making togas, to clay pots, maps of Greece, and types of columns...... We did a Greek Unit Study, so there are tons of activity ideas on my History Page. In the story, Pythagoras fixes his friend's reed pipes by modifying the lengths to specific rations. After the modifications are complete, they sound much better and the two boys are able to play music together. The book explained the ratios between the length and diameter and each pipe. My six year old was not big enough to do the math work, but she was able to measure the straws to the proper lengths. ..... and tested. At first she was disappointed, because they didn't make much sound. She quickly learned a better blowing technique and then found dad to show off. This is a series of link-ups for educators to share ideas and lesson plans for the upcoming school year. This week's topic is math. If you haven't linked up yet, there's still time to link-up to last week's writing lesson planning. Here's the rest of the schedule. Games, activities, Life of Fred, Math-U-See, and a few simple workbooks describe our approach to math. All children learn differently and some programs just seem to work best with certain kids. My eleven year old daughter thrives with the straight forward approach of Math-U-See, while Life of Fred makes my nine year old son think. We used these programs last year and although we will continue with them again this year I plan to play a lot more games with my son and use the curriculum much less. My six year old like many young children, learns about adding, subtracting, money, and time just by doing normal kid activities such as helping to cook meals, anticipating birthdays and purchasing her own stuffed animals. This year we will focus on adding and subtracting by playing Black Jack 21 and Adding War and skip-counting by playing Speed! Most mornings I plan to play a game or do a math activity with her and my son together, and once or twice per week work from Life of Fred with my son. In the future my six year old may follow Math-U-See, Life of Fred or some other math curriculum. For the mean time she can just play with math to learn. Now it's your turn. Please put a link back to Highhill Education in your post and share your plans for math. My girls decided to sew themselves ruffle brimmed hats decked out with fabric flowers. Next the circles were pinned wrong side together and sewn around the outside leaving a gap so the hat could be turned right side out. Then the circle was closed. Next the edge was pinned tightly and sewn with a decorative stitch to reinforce the edge. Elastic was measured around the wearer's head and sewn into place approximately 2.5 inches from the brim. At this point the hat was finished and could be worn. An elastic strap could be added to help the hat stay on. The flowers were made with a Clover Round Large Yo-Yo Maker and sewn around the edges. To make the leaves 3 inch squares were folded in half into a rectangle. Then the short ends were folded into triangles to align with 1/2 of the long ends resulting in a triangle. The long end was gathered and stitched to the flower. The pink hat required 7 flowers and the purple required 14. Imagability Wedgits and Design Cards teach and withstand the test of time. We received this toy as a gift eight years ago and the kids are still playing with it. 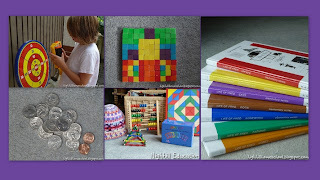 Wedgits are square shaped 3 dimensional pieces that fit together and are fun to build with. Using the cards as a guide is similar to following the instructions from an engineering drawing to build a sub-assembly. There are four levels of difficulty on the design cards. It took me a while to figure out how to build the designs from the fourth level when we first got this toy. They are challenging for my 9 year old, but he is figuring them out. While putting together this post I noticed that there is a set of advanced card designs. I put it into my Amazon cart.